Many of the Parkinson’s Pioneers with some family members who were praised at Moving Day 2015 in recognition of their contribution to neuroscience and the treatment of Parkinson’s disease. Back row: Steven Braithwaite, PhD (research scientist, Circuit Therapeutics, Menlo Park); Daniel Zwilling (research scientist, Circuit Therapeutics); Eric Sabelman, PhD (bioengineer, Kaiser Neurosurgery, Redwood City); Gary Heit, MD retired (neurosurgeon, formerly with Kaiser Neurosurgery, Redwood City); Anatol Kreitzer, PhD (research scientist, Gladstone Institutes, San Francisco). Second row: Anusha Allawala (researcher, Circuit Therapeutics); Robin Fross, MD (movement disorder specialist, Kaiser, Hayward). 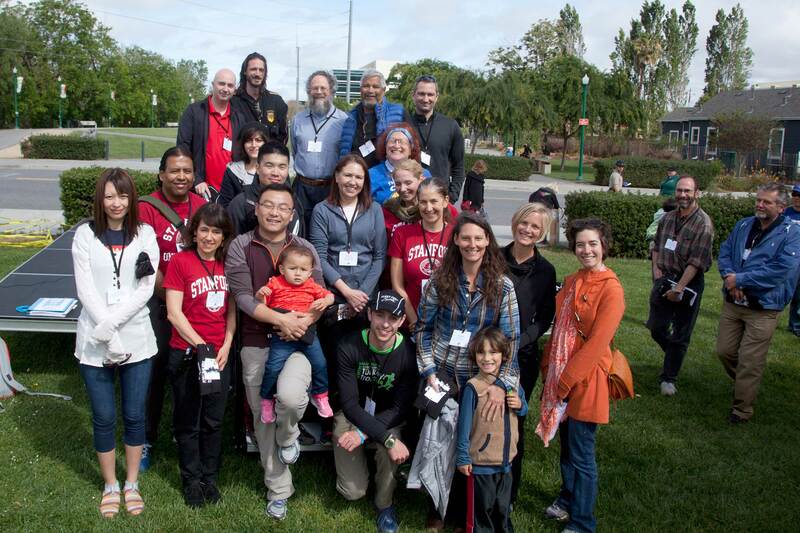 Third row: Carlos Rodriguez, RN (clinical nurse, Stanford Movement Disorders Center); Eric Zhao (researcher, Circuit Therapeutics); Monica Volz, RN (clinical nurse, UCSF Movement Disorders and Neuromodulation Center, San Francisco); Veronica Santini, MD (physician, Stanford Movement Disorders Center); Kathleen Poston, MD (physician, Stanford Movement Disorders Center). Front row: Xinnan Wang, MD, PhD (research scientist, Stanford Neurosciences Institute); Helen Bronte-Stewart, MD (physician, Stanford Movement Disorders Center); Jun Ding, PhD (research scientist, Stanford Institute for Neuro-Innovation & Translational Neurosciences); Nick Scalfone (researcher, Circuit Therapeutics); Kim Thompson (researcher, Circuit Therapeutics); Coralie De Hemptinne, PhD (post-doctoral fellow, UCSF Neurosurgery); Claire Discenza (researcher, Circuit Therapeutics). 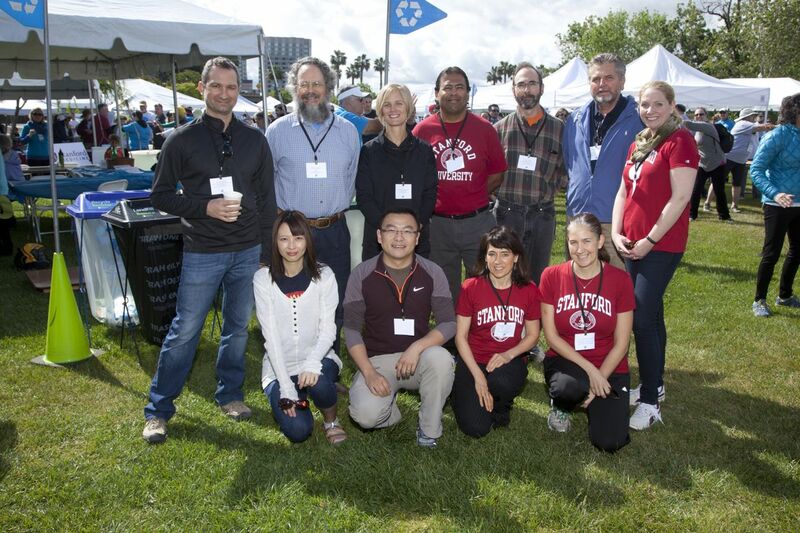 To the rear right: Sam Goldman, MD (physician, UCSF Neurology and SF VA Neurology); Krystof Bankiewicz, MD, PhD (research scientist, UCSF Neurosurgery) and hidden by Dr. Goldman is Barbara Nguyen-Vu (researcher, Circuit Therapeutics). Some of the Parkinson’s Pioneers. Back row: Anatol Kreitzer, PhD (research scientist, Gladstone Institutes, San Francisco); Eric Sabelman, PhD (bioengineer, Kaiser Neurosurgery, Redwood City); Coralie De Hemptinne, PhD (post-doctoral fellow, UCSF Neurosurgery); Carlos Rodriguez, RN (clinical nurse, Stanford Movement Disorders Center); Sam Goldman, MD (physician, UCSF Neurology and SF VA Neurology); Krystof Bankiewicz, MD, PhD (research scientist, UCSF Neurosurgery); Veronica Santini, MD (physician, Stanford Movement Disorders Center). Front row: Xinnan Wang, MD, PhD (research scientist, Stanford Neurosciences Institute); Jun Ding, PhD (research scientist, Stanford Institute for Neuro-Innovation & Translational Neurosciences); Helen Bronte-Stewart, MD (physician, Stanford Movement Disorders Center); Kathleen Poston, MD (physician, Stanford Movement Disorders Center). Thanks to Circuit Therapeutics for sponsoring the ceremony and to H&H Printing for printing the program. Moving Day® 2015 is a program of the National Parkinson Foundation.